Arvind Packaged Sewage Treatment Plant (PSTP) is housed in specially designed and highly durable FRP tank. These tanks are compact which can be utilized in a decentralized manner at any location, either it’s underground or above the ground. The Arvind Packaged STP is designed to bring the treated sewage parameters (BOD, COD, TSS, TN etc.) below the permissible limit which is stipulated by the Pollution Control Board. MBBR technology is used in this system. The influent sewage water passes through a bar screen to remove all the large objects like cans, rags, sticks, plastic packets etc. which are carried in the sewage stream. 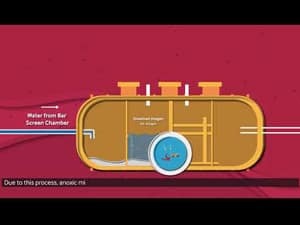 The first stage of PSTP is an oxygen-depleted anaerobic zone in which the solids in raw sewage gets settled while allowing the scum to float on the surface. It is a zone in which the settled sludge is stabilized by anaerobic digestion. The sewage then enters the anoxic zone in which denitrification of the wastewater stream is accomplished by returning the activated sludge from the final sedimentation zone to the anoxic zone; wherein dissolved oxygen levels are maintained approximately as 0.2 to 0.5 mg/l. In the denitrification process, anoxic microbes break down to the existing nitrates, this results in the release of inert nitrogen gas into the atmosphere. The sewage from solid separation zone flows into the aeration zone. Air is diffused with the help of air blowers which encourages the growth of bacteria cultures in and around the floating plastic media added in the aeration zone. The MBBR media provides the extended surface area for the growth of microorganisms. The next step of treatment involves the sedimentation zone where organic waste is settled. The settled waste in the bottom of the tank is pumped back to the anoxic zone as a return sludge, which is done to ensure that the quality of effluent must pass the stipulated sewage parameters. The secondary treated sewage is then passed through the Pressure Sand Filter and Activated Carbon Filter for the removal of suspended solids (TSS), colour, and odour. The treated water is then disinfected using sodium hypochlorite before it is reused.